A Vintage sewing Box & Table, Découpaged in Copper Trees paper sealed with protective dead flat varnish. 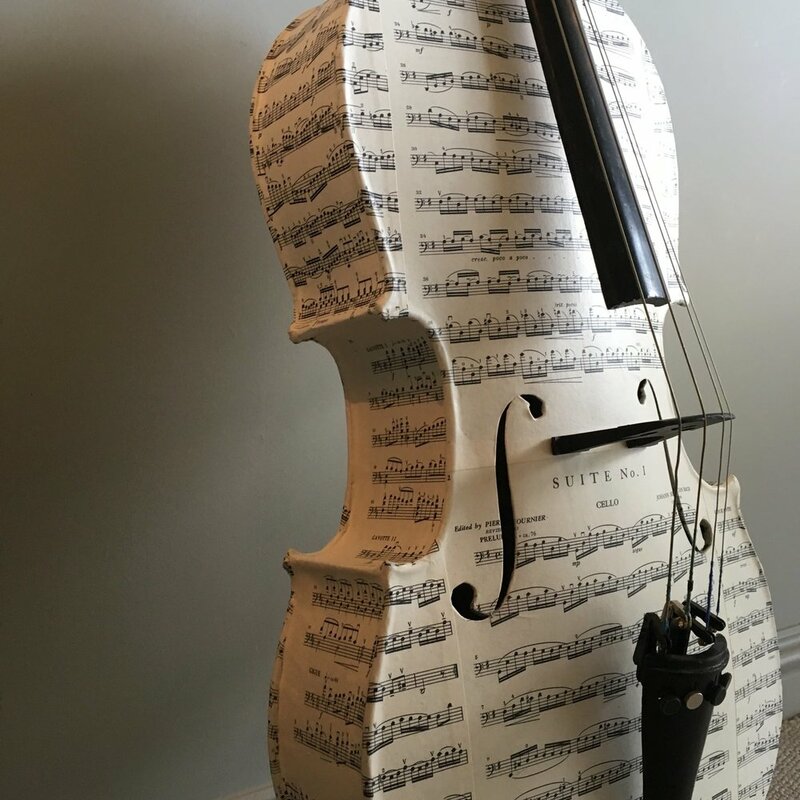 This Baby Cello becomes an art piece, reinvented via Découpage in pre-loved Bach sheet music. Coated in several layers dead flat varnish for durability. Baby Cello Découpaged in pre-loved Bach Sheet Music & bespoke poetry. 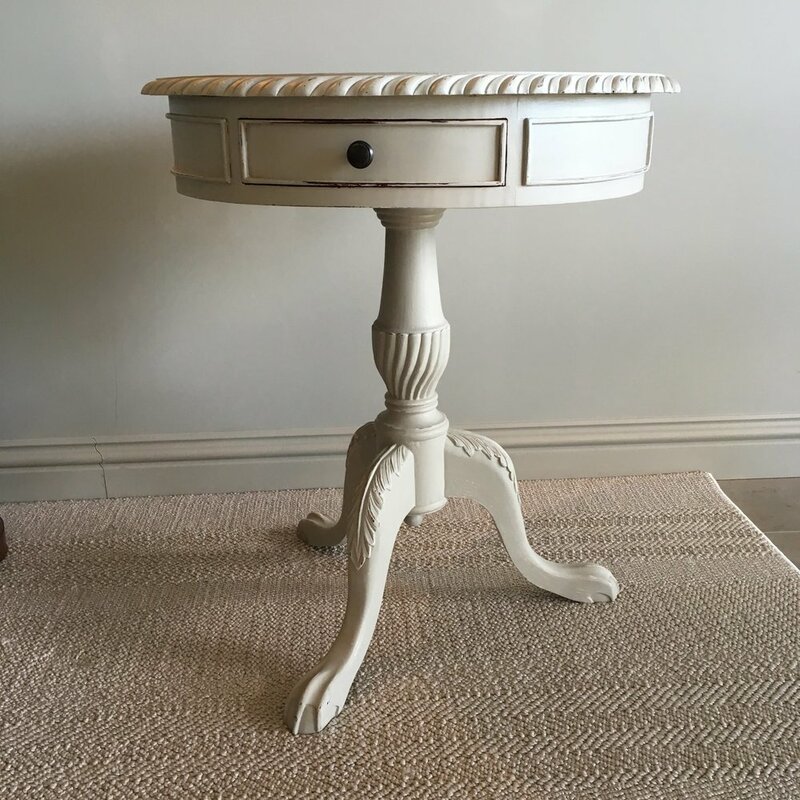 Shapely Drum Table, hand painted in Farrow & Ball Hardwick White & lightly distressed for a Shabby Chic look, with a carved pedestal base & two drawers. Circular Dining Table on pedestal base, hand painted in Farrow & Ball Dove Tail Estate Eggshell (Grey) over solid pine. Repurposed vintage sash windows, each single pane replaced with mirror glass. A fabulous way to create a clever illusion of space & light. Découpage side table in couture images with handpainted Queen Anne legs. Kiln dried and sustainably sourced grey washed plank top with slim pipe work frame. Kiln dried and sustainably sourced waney-edge Ash with slim pipe work frame. Large 1 metre wide Vintage Steamer Trunk. Decoupaged in OS maps from 1959 joining areas from Oxford through the Thames Valley to outer London. Sealed with a dozen coats of varnish creating a durable and functional piece. Genuine Artifort little Tulip chairs made in the Netherlands and designed by Pierre Paulin. A pair of genuine & collectible retro chairs. 'Entirely Roses' - A vintage bar back chair lovingly découpaged in rose cuttings, sealed with a dozen coats of varnish creating a durable and functional piece. 'Full Bloom' - A vintage spindle back chair découpaged in florals, sealed with a dozen coats of varnish creating a durable and functional piece.